This is a test to update the Delmont Report, now that I’m back in good health. Here is some good news for followers of Harley-Davidson: Retail sales in the third quarter were up 3.5%, compared to the 3Q last year when sales slumped 9.4%, according to a recently-completed survey of dealers by Wells Fargo Securities. There’s more good news as well: Inventories remain at five year lows and all of the dealers described inventories as comfortable/light with a need to improve the mix such as adding more touring bikes. Inventory levels are at about 40-45 days, according to the survey. However, dealers voiced concerns about the inventory mix and said there probably were lost sales due to lack of product availability on models such as the model year 2012 (MY12) touring, sportsters and softails. “We believe Harley underestimated U.S. summer demand, especially in touring (models),” says Tim Conder, Wells Fargo Securities senior analyst and author of the report. “It likely will be late fall before Harley has U.S. inventories normalized,” he added. The survey included 40 dealers located in 24 states across the U.S., approximately, 6% of Harley’s U.S. dealers and was skewed toward larger dealers in major metropolitan areas. The survey included 10 dealers in the East, 10 in the South, 10 in the Midwest and 10 in the West. The dealers surveyed were very aggressive in their marketing. In addition to selling new and used motorcycles, clothes, merchandise, parts, accessories and service, 98% of the participating dealers had Harley Owners Group (HOG) chapters, 55% offered rentals, 45% sponsored a Rider’s Edge training program and 33% had an on-line sales program. The dealers also were very aggressive on their pricing. Seventy percent of the dealers sold at MSRP, 20% sold at MSRP with what Wells Fargo calls “minimal discounts,” and 10% sold at a premium to MSRP. Twenty percent of the dealers said they were selling at least some new models below MSRP, compared to 13% in the Q211 survey by Wells Fargo, and 18% in Q310. The ratio of used to new bikes has improved from 2:1 to 1.75:1. The price gap between used bikes and new bikes has continued to narrow. Used bike prices were stable through the 3Q after rising for much of the last 24 months, according to Conder. Prices of used Harley’s are likely to continue to increase, year over year, over the next year, Conder predicts. Credit standards of Harley-Davidson Financial Services (HDFS) have remained basically stable between the second and third quarters this year, according to the dealers. Recently I found myself aboard a Ducati Multistrada 1200 S Touring, the über version of Duc’s über sport touring motorcycle. There’s a very fortunate perk of my job, and the positions of many others working in the business, and that’s getting the privilege of riding a number of different motorcycles from a variety of OEMs. Quite simply it’s a motorcycle geek’s dream gig — even with the long hours of staring at words on a computer screen (that’s the writing geek’s dream job, a different story entirely). This time around, thanks to Ducati’s PR dude extraordinaire, John Paolo Canton, I got about two-week’s seat time in the Multi, my first time on the do-all machine since its reincarnation as a superbike motor-powered touring bike. When I picked up the bike from Tom Hicks’ Southern California Ducati in Brea, Calif., (home to Ducati’s press fleet) I didn’t know what I was expecting. I’d read about the four different engine modes but hadn’t given it much thought. Didn’t know I’d be giving it a lot of thought later. A brief run-through of features with a tech and away I went. And that’s when I discovered something about the Multi 1200 S: That ride home made me feel like I was discovering motorcycling again. Settling into the machine over the next many days, this feeling of newness grew more intense. Sport mode was way different than touring mode as was urban and enduro. Switching back and forth between the settings offered a new type of thrill each time. Just the feel of it. The upright and very comfortable seating on a bike that produces 150hp simply felt like a entirely different experience. Freeway cruising (touring). Short trips to the store and around town (sport). Quick trips around the block (urban). Long rides through the twisties of Southern California’s San Gabriel Mountains (sport). Commutes to work and back (sport, OK, there’s a trend here). Each one a journey unto itself. The bike’s been on the market for a while now, so I’m not the first person to ride it or write about it. I’m just one rider with an opinion which, when it comes down to it, that’s what we all are. One man’s hyperbole is another man’s yawn. And with motorcycling, more than anything in life (save for your tastebuds or musical inclinations), riding is a singular event specific to one person at one particular moment in his or her life. That’s why each ride is an adventure. Why one bike that works for this guy might not work for that girl or the other dude. In this case, riding the Ducati truly felt like learning anew the thrill of motorcycling. Alas, it soon was time to return the loaner and settle quite comfortably back onto my own Thruxton — like putting on an old, British, shoe. This experience got me thinking about my current ride and my past motorcycles and scooters. How often do I take the time to rediscover the thing that’s in my garage? To make the changes and tweaks to make my next ride that much different? To make me feel like I’m rediscovering motorcycling? To be honest, not enough. It’s been a while since I uncorked the Thruxton’s motor, replaced mirrors, mounted a fairing or changed the suspension. How often and in what ways do you help your customers rediscover their own machines? How often do you do the same with yours? I’ve got an assignment for you that may propel you headfirst into this year’s top marketing trend: mobile e-commerce. Why should you care? In this morning’s Learning Experience Marketing session with Craig Cervenka at Dealer Expo, it was said that an estimated 75 percent of people will try mobile shopping at least once this year. 75 percent. If that doesn’t reel you in, how about if I tell you that your assignment will take just 5 minutes, and it’s free. Make sure your business is listed in Google Places. 3. Create a Google account or log in, if you already have an account. 4. You’ll be redirected to a page where you can “List Your Business.” Just follow the directions on the page. If Google doesn’t have the information on-hand, you’ll enter your address, website phone number, and some other pertinent information. WHY THIS IS IMPORTANT: If a local customer Google’s your dealership name, or even a keyword like “motorcycle jacket,” you have a better chance of landing on Google’s front page for local results. There will be a map, your address, web address and phone number, all there for them to see. Also, Google automatically formats its Places pages for mobile screens (iPhone, Android, etc. ), so you’ll get a nifty little mobile page as well. 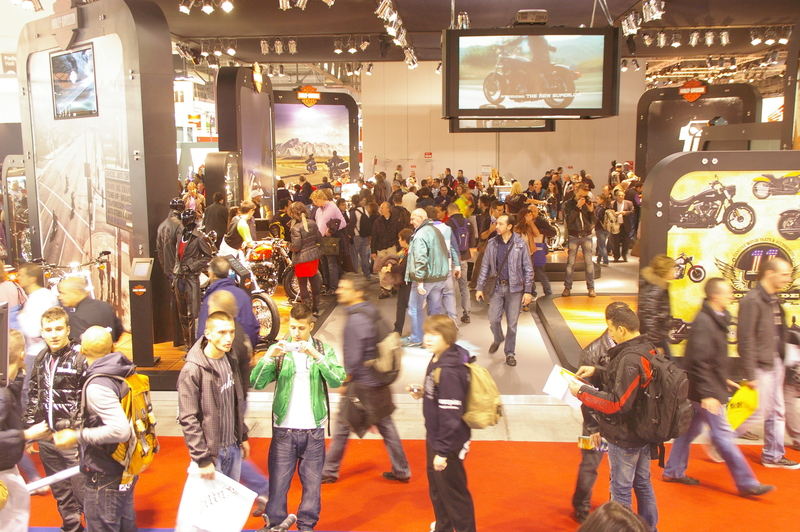 MILAN (Wednesday, Nov. 3, 2010)— The second annual EICMA-China motorcycle show has been scheduled for July 2-4,2011, at the China National Convention Center in Beijing, show organizers said here today. Plans for the show were announced at a press conference conducted by the event’s planners: CIME (China Italy Motorcycle Exhibition), a joint venture of EICMA, the China Chamber of Commerce for Motorcycles (CCCMA) and the Genertec International Advertising & Exhibition Company. This year’s show was held last July in Beijing and drew 130 exhibitors and about 45,000 attendees. More than 200 exhibitors are expected to participate in next year’s show, said CCCM’s Bingnan Chen. The U.S. Economy Is In a Flatline Mode. Last January, I attended a dealer 20-Group meeting and offered my outlook for the year. In a nutshell, I told the dealers not to expect a flood of excited customers in the spring; it just wasn’t in the cards. And, in my view, they would be better off planning for a slow season rather than hoping for a heavy increase in floor traffic. I was roundly criticized by one successful dealer for being too negative. Unfortunately, traffic did not pick up in the second and third quarters and this quarter doesn’t look too hot, either. Now, looking ahead, I don’t think there is much hope for a big improvement in 2011. I’m basing my initial forecast in part on what I’m hearing from a number of sources, and in part on an excellent analysis that appeared Oct. 12, 2010, in the New York Times. The lengthy report carries the gloomy headline, “Across the U.S., Long Recovery Looks Like Recession.” I suppose I could stop right here; you get the point. The bottom line is that it’s going to take years to recover from this recession, the downturn that’s been the worst for this country since the Great Depression. Consider the situation as you build your 2011 business plan and as you stand in the voting booth next month. Is there an electric motorcycle in your future? This story originally appeared in the Dealernews August 2010 issue. Looking for new incremental revenue? Why not consider selling electric motorcycles next year? New research indicates it may be worthwhile. “If an established OEM got electric machines into their dealer organization,” Greg Boeder says, “I think you could start to talk about selling quite a few units.” Boeder is a senior partner at Power Products Marketing (PPM), a Minneapolis firm that tracks retail sales in the powersports market. PPM recently completed research on the market potential for electric motorcycles in the U.S. The project included surveying OEMs that are building electrics, and others that are considering doing so, as well as more than 100 owners of electrics. Initially, the task force is looking at two broad areas: government regulation and consumer education. The government work includes developing technical specifications. On the consumer side, the task force wants the industry to present a consistent message to buyers about electric motorcycles, to help potential buyers compare machines on an apple-to-apple basis. Says Vitrano: “The industry has to speak clearly so that consumers understand the product and are not confused.” The task force is developing an FAQ, or standard lexicon, so the public understands the definitions of key terms that are unique to electric vehicles. The market potential for this segment today doesn’t seem to be very large, and there doesn’t seem to a major player in the field yet, according to Boeder’s research. But it’s worth noting that Polaris has made a commitment to electric vehicles with its Breeze neighborhood electric vehicle and its Ranger electric UTVs. Dealers probably shouldn’t rush out and buy electrics. There are some considerations beyond limited product availability. Experts note that the sales conversation is different for an electric machine, and the sales staff requires training in the features and benefits of this new segment. Service staff also require new training, and there will be some new parts to be inventoried, such as batteries and controllers. Electric bikes may not be worth it this year, but they may be worth keeping on your radar for next year. How valuable is your last customer? Are your best employees the ones interacting with your customers? The ones who know your product line the best, the ones who are the most affable, the most personable? If they aren’t, why aren’t you training them to be? Suzuki’s Rod Lopusnak asks dealers to consider “The Foot Locker Challenge.” When a person walks into any Foot Locker shoe store, that person gets a better sales presentation than if he or she were walking into a motorcycle dealership to buy a new bike. Foot Locker’s sales staff is professional and well dressed, and usually tries to upsell related products, not just the $100 pair of cross-trainers. Foot Locker employees are trained in the company’s sales processes. Alas, the same can’t be said for many powersports dealerships. Lopusnak, who is the OEM’s national sales manager, joined Clark Vitulli, Arnie Ackerman, Paul Leinberger and Steve Johnson on a “Success Strategies” panel discussion held last month during Tucker Rocky’s annual sales meeting and dealer show near Dallas. The hour-long discussion covered lots of things, from MAP policies to the best ways of reducing labor costs and cutting back on inventory. But the two themes that seemed to color every other topic were training and education — and that it’s up to the dealer to set the standard employees must follow. Vitulli, owner of Harley-Davidson of St. Augustine (a Top 100 dealer) and former CEO of America’s PowerSports, said frontline employees — the greeters, parts counter reps, sales staff, etc. — need to be trained well. These people need to be bulletproof, he said, and have to know exactly what they’re doing in their respective departments. When the tone is set from the top down, the effects transcend departmental boundaries. I think back to any of my previous employers. When the management was good, work went smoothly. If management sucked, so went the workday. • Make sure you offer something your competitors don’t. • It’s important to build a relationship with your customers. • Stocking parts and accessories that have high turn rates makes sense. • Make the dealership a fun place for customers and employees. • Offer training and licensing for new riders. • Monitor your store’s metrics. Sound familiar? These are the fundamentals of any good business. These are the topics that Dealernews columnists and others have covered over countless magazine pages for decades. Whenever I come across discussions like this one, I can’t help but link them to my own experience with retailers, whether they be motorcycle dealerships or my neighborhood market. The takeaways are the very things I require, as a consumer, out of a retailer. If they’re not there, I take my business elsewhere. I’m not picky, but I know I have options. Why not pick the best option for my needs? This year’s Top 100 competition again offers a Merit Award for Best Customer Service. It’s an important award, recognizing a dealership for the most innovative and successful customer service program it has created and implemented over the last year. Once you get through your basic Top 100 nomination form, you’ll be sent an e-mail inviting you to qualify for one of nearly 18 individual Merit Awards.